A well-crafted stage-based puzzle game has to put its pieces together just right to make for a satisfying total package. The core mechanic needs to be interesting and clever, being simple enough to grasp quickly while offering enough depth to allow for that great feeling that comes from learning something. The difficulty curve needs to be as smooth as possible, and the stage design needs to have enough flexibility to keep levels from bleeding into each other. And if the game is beautiful, more’s the better. Summit Way ($1.99) checks off all of those boxes with aplomb, making this unassuming little title a must-have. 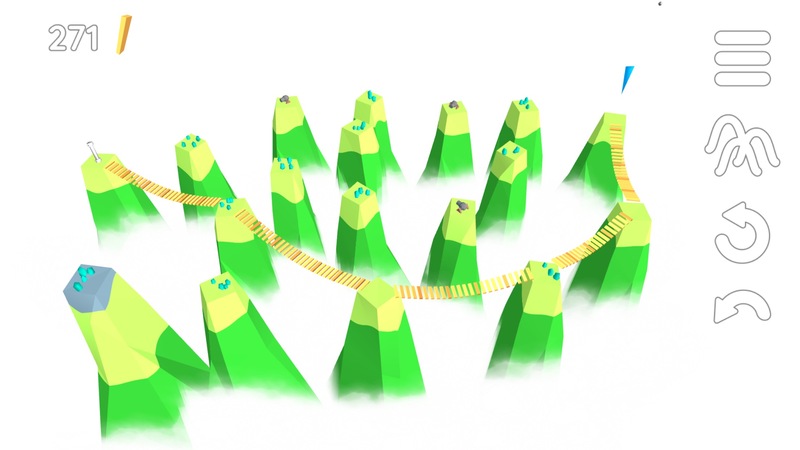 The basic idea behind Summit Way is that you need to build bridges to connect all of the summits, making sure to loop back to the start when you’re done. You can’t build more than two bridges on each summit, so there’s no going back once you’ve hit each one. You can only build a bridge if the path between summits is clear, as well. If another mountain or bridge is blocking the way, it’s a no go. You also need to consider the relative elevation of the summits you’re trying to connect, as you can’t build a bridge if one is too much taller than the other. Should you successfully join all of the mountains up, you’ll move on to the next stage. Well, that’s plenty for a puzzle game to work with, isn’t it? Arrange the stages just so and you’re off to the races. Except that’s just the beginning for Summit Way. Like many great puzzle games, Summit Way has a few more gimmicks to introduce as you play through the game. The first of these adds a new dimension to the game. You see, your bridges don’t come from nothing. They’re built using wood, and longer bridges use more wood. The logic checks out. Your wood supply is limited, and your star ranking on each stage is based on how much wood you have left at the end. At first the amount of wood you’re using is a total afterthought, but it soon becomes just about everything. Some stages give you the opportunity to replenish your wood by bridging your way over to summits with forests on them. By “opportunity", I mean you’ll start off with a pitiful amount of wood and will need to trace your route carefully if you want to get anywhere. Wood isn’t the only resource you need to manage, either. Before long, you’ll come across summits with villages on them. They’re hungry, and if you want to build a bridge to their little slice of the world, you’ll need to bring some food as a present. Luckily, every village summit is accompanied by a summit where food can be harvested. Stop by there first, and you’ll be all set to stop by a village without breaching etiquette. But wait, now there are castles. They have enough food, but if you want to pass by them, you’ll need to bribe them with some gold. Said gold can be conveniently mined from summits with mines on them. On top of all of that, some mad fool has put cannons on some of the peaks. If you don’t visit those peaks first to disable the cannons, your bridges will be blown off of whatever peak they’re aimed at. So you need to visit forests first to collect wood, grab food before heading to villages, and mine some gold before going to castles. Take out cannons before crossing their paths, don’t run your bridges into each other, make sure you hit every summit, mind the height of each, and make sure you’ve left a way back to the start. Don’t run out of wood, either. Holy smokes, now we’re cooking with gas, aren’t we? After rolling all of these mechanics out to you in the first few sets of levels, you’ll head on your way to finish out the 72 included stages. No stage is quite like the last, and there are plenty of gimmicks and tricks here for the designer to juggle and combine to ensure that you’ll be meeting fresh challenges all the time. Along with the interesting mechanics, the stage design serves as the star of the show here. It’s simple and straightforward when it’s trying to teach you, and devilishly tricky when it’s time to test you. I find a lot of puzzle games wait too long to really challenge the player, leaving too few of the remaining stages to truly cut loose. 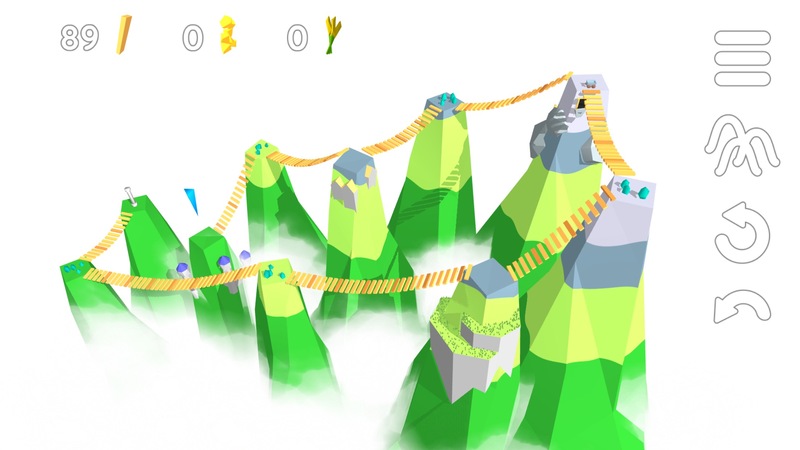 Summit Way gets all of its lessons out of the way relatively early in its stage count, giving you a nice, meaty chunk of levels that have access to the full complement of mechanical tricks and obstacles. Should you find any particular level impassable, you can always skip it and move on to the next one. There aren’t many punishments or penalties here. Making a mistake doesn’t cost you anything, and you can always reset the stage or take back any number of moves at the tap of a convenient button or two. Summit Way‘s presentation is quite nice, as well. It looks simple and soothing, yet manages to convey quite a bit of information with clear visual markers. Little touches like having each layer of the hills use different colors make it easy to tell at a glance which height each is, and simple messages will always pop up to let you know why you can’t make a particular move. The audio isn’t quite as strong. There isn’t any background music, leaving only an assortment of simple sound effects to punctuate your trials. I suppose it leaves your mind clear to concentrate on solving the puzzle at hand, if nothing else. Apart from the lack of music, it’s hard to find many nits to pick with Summit Way. Its core mechanic is strong, its gimmicks support that mechanic excellently, and the stage designs take advantage of all of that to give the player a fair but solid challenge. It would be nice to see more stages added at some point, but I can’t really complain about the amount of content that is already here. 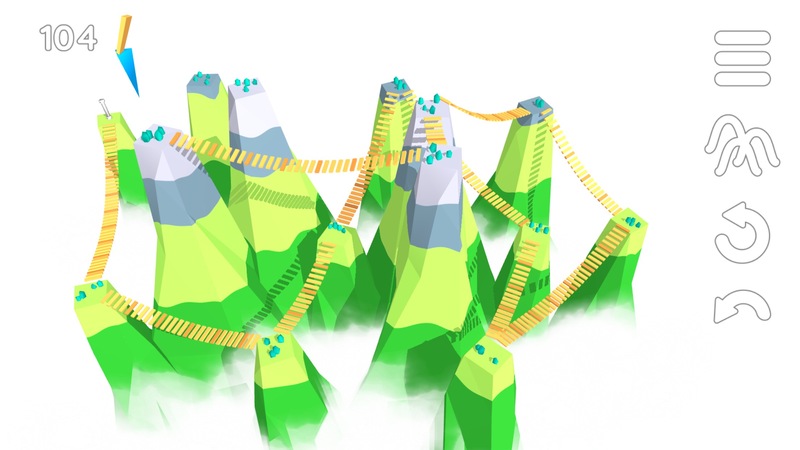 If you dig strategic puzzle games, make sure you pick Summit Way up. It’s fresh and enjoyable, teases the brain in just the right ways, and is somehow oddly relaxing to boot.